You’ve dreamt of sailing off into a sunset since Australia’s first America’s Cup but alas, there’s always been something in your way: a career, perhaps, or some kids; maybe a mortgage. How rude. But how fortunate, then, that you needn’t commit to a new line of credit (or life) to live as a yachtie in the Whitsundays. Bareboating around these islands – not that there’s anything terribly bare about it – is the best-kept secret (well, semi-secret) you’ve been looking for. Here, we’ve answered your most commonly asked questions. Oh, come on – you know the answer to that. The azure waters, the powdery white beaches, the 300 days of sun each year. The Whitsundays are one of the best sailing destinations in the world. No. Some bare-boating companies prefer you to have around five hours’ experience on a yacht but mostly, if you can drive a car and you’ve got common sense, you’ll be able to drive one of these boats. You’ll also be provided with a briefing on arrival. You can sleep up to eight people on many of the Whitsundays ‘bare’ boats. Don’t expect to pay more than around $120 per person per night. 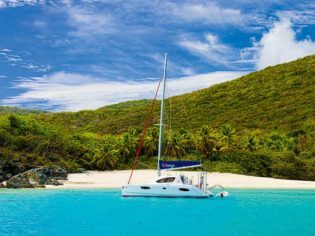 Rates vary depending on company, season and availability, of course, but we were quoted between $3000 (for an older catamaran that sleeps four) up to about $8000 (for a newer catamaran that sleeps eight) for seven nights in peak season. The best peak-season deal we found was a relatively new, eight-person catamaran for a seven-night trip at $78 per person per night. Well, you’ll also need to budget an extra $30 per person per day for the marine park and admin fees; $30 per person per day for your insurance waiver; and around $35 a day for fuel. Many companies hire stinger suits at reasonable rates, otherwise Fun Rentals (next to the Caltex servo on Shute Harbour Road in Airlie Beach) loans them out at $20 for seven days. Other than that, your only costs are food … And champagne. You might. If you’re prone to seasickness, we can’t promise you won’t get seasick. However, there are plenty of sheltered areas, thanks to the wind-buffering effects of all the islands, so you’re not likely to suffer terribly. What does ‘bare-boating’ actually mean? ‘Bare’ boats are actually very well equipped – the term refers to the fact that they’re available for rent. Usually, they’re owned by people who are too time-poor to spend their days on board, and are rented out by a third party who manages the yachts in much the same manner as a leasing agent manages properties. Stunning vistas of the Whitsundays. Image by Tourism Whitsundays. There are six charter companies in the Whitsundays. Sunsail is based on Hamilton Island, while the rest are based at Airlie Beach – Whitsunday Rent-a-Yacht is based at the Shute Harbour end, and Whitsunday Escape, Queensland Yacht Charters, Charter Yachts Australia and Cumberland Yacht Charters are all based at Abel Point Marina. If you’re a keen sailor the annual Airlie Beach Race Week and Audi Hamilton Island Race Week are held in August. Snorkel, hike, picnic, drink champagne, sunbake, go fishing, drink more champagne, visit the islands, nap … it’s all up to you. Sailing the Whitsundays is the perfect holiday for those who love the great outdoors. For more information and where to book visit Tourism Whitsundays.